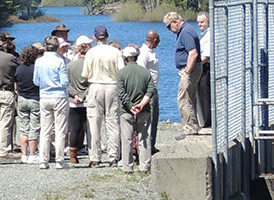 To celebrate BC Water Week and throughout the summer, the Capital Regional District is holding tours of the Greater Victoria Water Supply Area & Facilities. Ever wonder how your drinking water is delivered from source to tap? The Capital Regional District’s Get to Know Your H2O Tours are a great way to discover how your drinking water is delivered from the source to your tap. During the tour you’ll discover the natural landscapes, water supply reservoirs, and the treatment process that provides Greater Victoria with high quality tap water. Residents of the region are invited to register for a free tour guided by CRD staff onboard a school bus. There are several tour options and each tour will have various stops for you to disembark and see your water system up close. Each tour will leave from the CRD Field Office on a school bus that will be guided to various stops within our protected watersheds to let you discover these special places first hand. All tours require advanced reservations. Online registration opens on Wednesday, April 20. Follows the flow of water starting at the north end of Sooke Lake Reservoir. This tour explores the surrounding forests, Rithet Creek (main tributary to Sooke Lake Reservoir), water supply facilities and the treatment process that ensures the water delivered to your tap is optimal. Recommended for ages 12 and up. Location: Meet at the CRD Field Office parking lot – 2955 Sooke Lake Road (near Goldstream Park campground). Directional signs will be posted.